I am not a football fan. I can’t personally get invested in a game or sport that I have not trained for, am competing in or know anyone personally that is training for, competing in. But that is just me. I can understand the whole “home team” mentality to a point- I just don’t get how so many people can get so carried away with a sport that they all watch from their couches. With that being said- this last Sunday was Super Bowl- and it was in Phoenix. I am not even going to start on the insanity that was traffic for the last two weeks, but I am going to talk about how well our cities (Tempe, Scottsdale, Phoenix, Glendale) do when we host. If I had time and money I would have had a BLAST here over the last two weeks! But alas, no time and a joyous month long bout with bronchitis kept me from enjoying ANY of the festivities anywhere. SIGH. Kicking off January was Barrett Jackson Auto Auction- which is always a pretty big deal here in Arizona, as there are a TON of car enthusiasts. This year though, was a doozy as Ron Pratt sold off his epic car collection. (For more info read: Ron Pratte Barrett Jackson) People lost their ever-loving minds, the hubs had the entire week on DVR- didn’t want to miss anything, you know. Following that was the Phoenix Open. No, I am not a golf person either- but I love concerts, and the Open always has plenty of parties happening in the Bird’s Nest. This year they had Darius Rucker (Hootie and the Blowfish. Sorry, man. You will always be Hootie to me.) then Friday night was Kid Rock. Apparently a missing toothed Tiger was sighted- but then so was Marky Mark. Guess who I would want to see? HMMM. Not one to let the momentum slow, Saturday Maxim was throwing some insanely swag event. This was just the parties in Scottsdale. Heading west to Phoenix, Pitbull and Enrique Iglesias were there- Hitting WestGate was Jason Aldean, Dierks Bentley and Florida Georgia Line rounded out the party, just a hop-skip-and-jump from Cardinals Stadium. All the while there was the NFL Experience that blew up the entire downtown Phoenix area. $35 a pop for tickets, and sales were over 170,000. That was just for those that paid to go inside. The news stated they estimated some 400,000 people gathered in and around for the free festivities. Now here is the funny part. 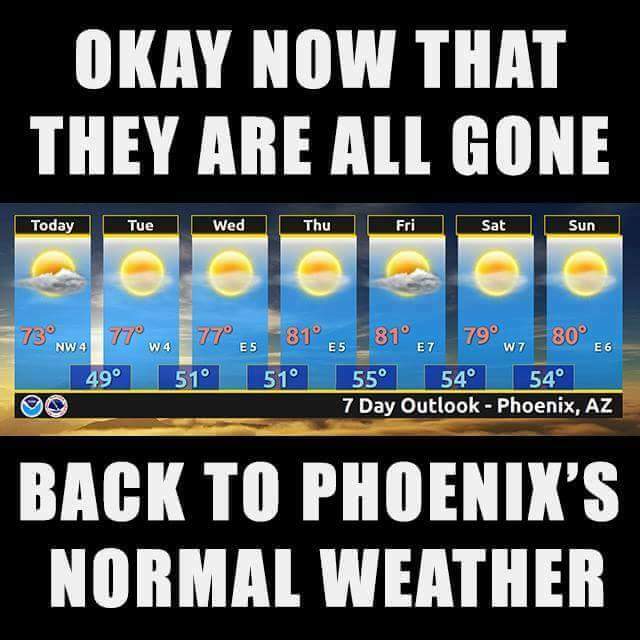 Phoenix is known for it’s incredible winters- blue skies, warm days…Well, not this year. It rained on and off for the entire two weeks of Phoenix Open/Super Bowl madness. 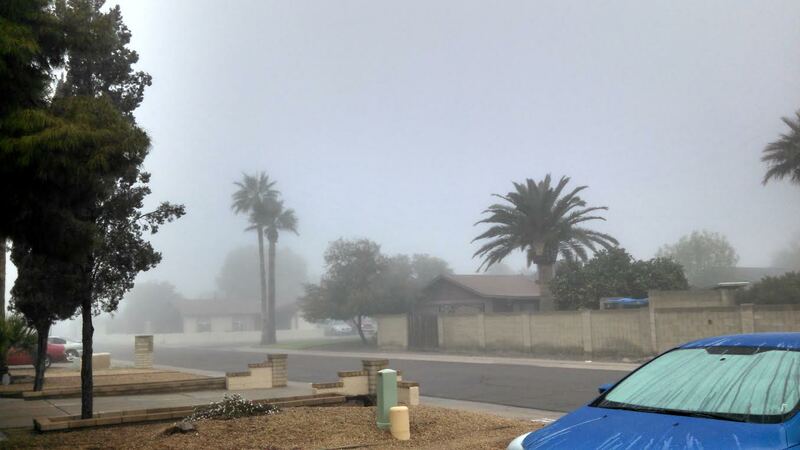 As a matter of fact, Super Bowl Sunday the FOG, yes FOG (which we NEVER get) was so thick that I couldn’t even see the elementary school across the street from my house. It did finally clear up around noon on Sunday- and the day was a spectacular one- so I am sure the party vibe was insane for the Super Bowl and post parties, etc. But you know what is hilarious? Sort of sad though considering how many people got the shaft between weather and lack of SB tickets- Monday morning was bright and clear, and we don’t have any rain in the forecast.